IP Standard test methods (STM) is an essential part of any quality control regime for petroleum testing laboratories. 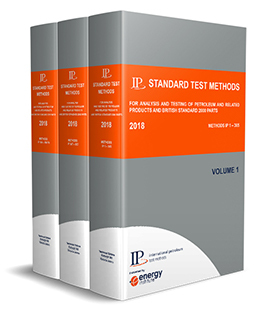 A necessary tool for the national and international testing of petroleum and petroleum products, the 2018 version of IP Standard Test Methods also enables laboratories to provide evidence of compliance with the most up to date test methods during inspections. Revisions to existing test methods are detailed in a summary of changes at the end of each method. Sold in a 3 volume paperback set and includes a searchable, USB stick. To purchase individual methods, visit the IP Test Methods section of the site.